My team had a potluck holiday lunch party yesterday and this was the dish I brought. 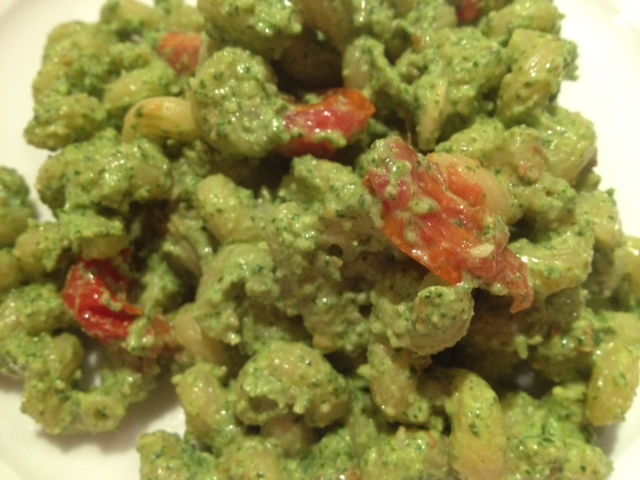 I wanted to make a pasta dish so I decided to do a pesto pasta with a twist. The roasted tomatoes in the pasta add an extra burst of flavor that pairs well with the richness of the arugula and basil. It was a hit! 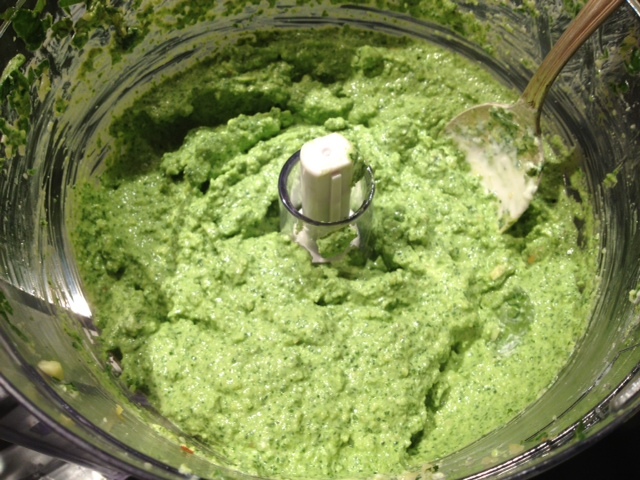 In the food processor, add the basil, arugula, lemon juice, lemon zest and blend until finely chopped. Then add the slivered almonds, sour cream, 1 tbsp olive oil and a generous sprinkling of garlic salt and hot red pepper flakes. Blend again for a longer period of time until the mixture is smooth and creamy. To roast the tomatoes, slice the grape tomatoes in half and put in a mixing bowl with 1 tbsp of olive oil and salt. Put on a non-stick baking sheet in a 350 degree oven for about 15 minutes. 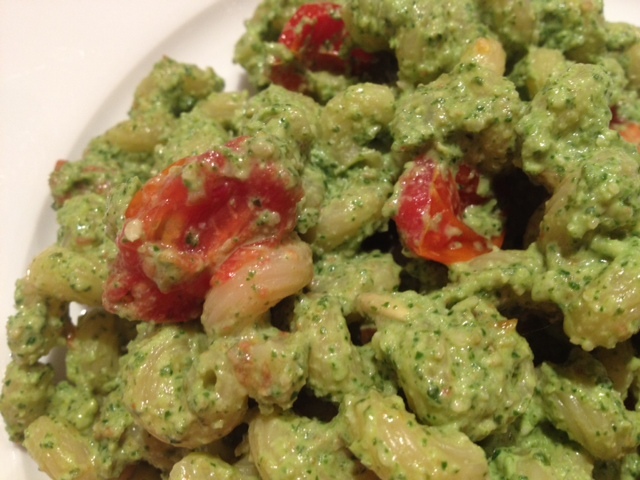 While tomatoes are roasting, boil your pasta as directed on the box to al dente. After the pasta is cooked, drain all excess water and put the pasta back into the same pot. 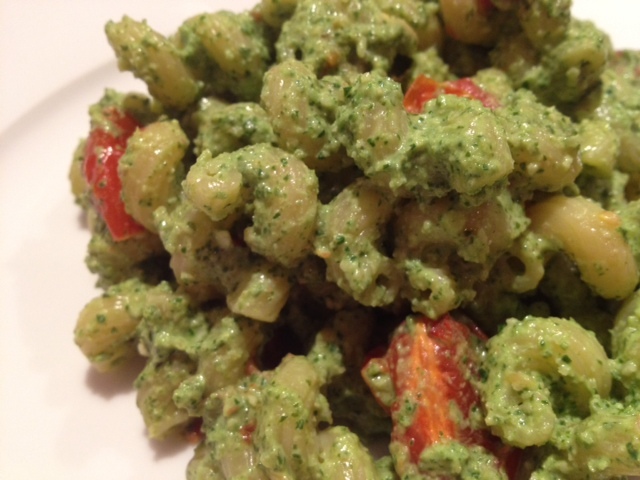 Add the pesto and roasted tomatoes and mix well to combine. ← Simply Delicious Sweet Potatoes. 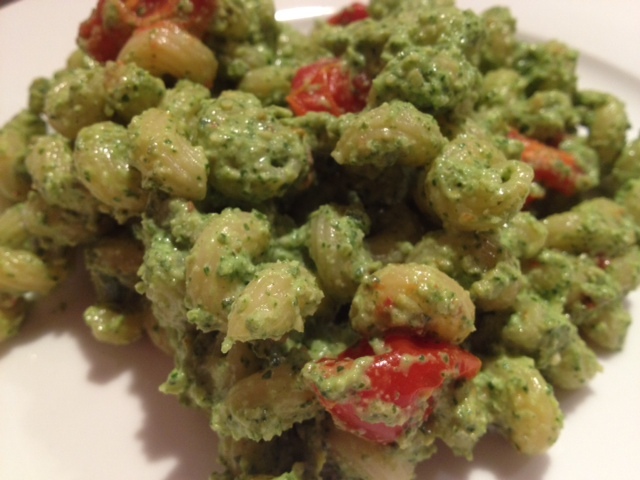 Pesto is the best….yum yum num num.